The national holiday honoring the life, mission and achievements of Martin Luther King, Jr., is an amazing opportunity to turn a “day off” into a DAY ON MISSION to serve and help bring more justice, love and light into our world. Monday, January 21, 2019 is this year’s MLK Day of Service, and we encourage all Marchers to find and join a service project in Houston or wherever you are in Texas or America. We will update this post with additional opportunities, and begin it with one of the largest group of service projects hosted by YMCAs in and around the Houston area. Please click this link and scroll down to see the various opportunities for service on Monday, January 21, 2019. Another opportunity for service is with the Mission Continues. Click here to sign up and join them on Monday, January 21, 2019. Have you noticed the March For Justice coincides with MLK weekend this year? We March each year on the third Saturday of January, and we hope that this year’s intersection of the March For Justice with MLK Weekend helps amplify the power of the MLK national day of service. From the stage, during the March, in emails, on our website, and in social media, we remind all who join us of MLK’s call to service. 70 years ago, the Women's Armed Service Integration Act was signed by U.S. President Harry S. Truman, and this 70th anniversary will be observed in Austin and around America on Tuesday, June 12th. THE SATURDAY BEFORE... veterans from across the services and across the U.S. are joining us here in Houston, where we're marching for the rights and recognition of women veterans in Texas and in America on Saturday, June 9, 2018. SIGN UP NOW: we will update you with opportunities to recognize these valiant women and join us in honoring the women who have served, CURRENT serving women from all the armed forces, and the young women still in school who will serve and defend our nation and our democratic values. We live in a moment when fascist and anti-Semitic ideologies are vying for legitimacy, when hate-filled rhetoric is fueling a resurgence of historic evils including violence against black and brown women and men. Physical hate crimes and violence are rising in direct response to words of hatred and verbal attacks on race, ethnicity and gender. At its best, the Women's March is an international movement of hope, resisting this hatred with repeated emphasis on loving our neighbors, and acting in that love to stand with our neighbors, particularly those most vulnerable or under attack. The Women's March started as a visceral response to the arrogance of power, to the ugliness of the 2016 election, to the misogyny and hate fed by a broken, corrupt, cynical patriarchy. From Houston to Hong Kong, from Austin to Argentina, all across the globe, women stood up with their allies and said, "Enough is enough!" This ugliness does not represent us. We are better than this. The Houston Women's March rejects hate speech and ethnic discrimination of all kinds. Our first values statement as an organization was saying "No!" to the hate-filled menace of white nationalism erupting in America. Our recognition and support of the worth of all persons also led us to say "No!" to the actions earlier this year of national Women's March activist Tamika Mallory in conjunction with Louis Farrakhan, identified by the Southern Poverty Law Center (SPLC) as an anti-Semitic extremist who repeatedly appears on SPLC's "Hate Watch" alongside white supremacists and the Ku Klux Klan. We categorically stand against the anti-Semitism, racism, LGBTQIA attacks and misogyny Farrakhan promoted in the event Mallory attended and publicized. Recent actions taken by Mallory have raised new concerns. The context? Mallory opposes the inclusion of the Anti-Defamation League (ADL) as one of the contributors to coffee giant Starbucks' emerging anti-bias training, describing ADL as "constantly attacking black and brown people" and calling for a boycott of Starbucks until ADL is removed. We are appalled that two black men were arrested at a Philadelphia Starbucks while sitting peacefully at a table yet not ordering. We agree that Starbucks must demonstrate that it values all persons of every ethnicity and must train managers and employees in recognizing bias and how to act without discrimination. We do not agree with Mallory's description of the ADL which — similarly to the NAACP — has a long history of working for justice including designing anti-bias training. Like the SPLC, the League maps hate crimes, spearheads hate crime legislation and intensified a 50-state initiative after what ADL described as the "heinous" mass shooting at a church in Charleston. We wish that Mallory instead had used her voice to encourage Starbucks and its anti-bias advisors (including the NAACP, ADL, Equal Justice Initiative, Demos, former Attorney General Eric Holder) not only to design powerful anti-bias and anti-discrimination training, but to designate their materials as "open source," making them freely available for every other corporation and organization in the world to use and to improve. That is a call to action worthy of a leader with the Women's March movement. Unfortunately, this is not the first time a figure with the National Women's March has prioritized personal activism over the generous and good-hearted international movement that millions of women and allies have built through personal sacrifices and volunteer sweat equity. The unifying work of the Women's March is too crucial to let the world wonder whether its national leaders are anti-Semitic and racist or whether they're unwilling to rise above personal agendas to serve all the women and allies of the March. Together we rise, together we will overcome. To this end, the Houston Women's March calls upon national, state and local Women's March leaders for the following specific actions. 1) We call upon national Women's March leaders to refocus and articulate who we really are. We include the Jewish, Buddhist, Muslim, Christian, Hindu, Sufi, Native American, agnostic, atheist women of Houston, of Texas, and of America. When you stand with those who incite hatred against Jewish and LGBTQIA human beings, when you ally yourselves with racism and misogyny, you do not represent us. We need to hear and see your commitment. 2) We ask other city, state and international Women's March organizations to join us in our call to the national group: "If your definition of 'my people' does not include all of us and if you won't denounce hate speech and ethnic discrimination, you can't lead the Women's March." 3) We call upon Mallory and the national leaders to go beyond their initial statements in this matter of Farrakhan's hate-mongering and to name and reject Farrakhan's hate speech. Mallory has spoken of the commitment Farrakhan's organization shows to disenfranchised and incarcerated people and communities and of her personal connections and relationships. We say to Mallory: Yes, we can support community leaders while naming and rejecting anti-Semitism, racism, LGBTQIA attacks and misogyny. Join us and do just that. 4) We call upon the national Women's March to reorganize and better serve the grassroots leadership in American cities and states, re-aligning mission and values with the autonomous local organizations, who are separate legally and financially from the national group. Our city and state marches are connecting and empowering women and girls to take action for themselves and their communities, investing in diverse leadership teams, building progressive networks and registering and inspiring voters. If you've marched with us in Texas, you've seen the signs held by women and men representing our values: health care, immigration, children, racial justice, gender equality, education, empowerment, voting, gun safety and more. Some signs use humor, some are intensely personal, and almost all capture an enormously significant component of the Women's March: us. We the people. We rebuke hate and hate speech, we stand with love. We stand with women of every race, every ethnicity, every faith orientation and gender description, those who have marched with us and those who haven't marched with us yet. We love our neighbors, and we're in this together. Here in Houston, we are building a regional Women's March nonprofit led by volunteers who are black, white, Latina, Asian, Middle Eastern. In our faith we are Buddhist, Jewish, Muslim, Christian and other. Here in Houston, Muslim and Jewish women gather together as part of the Sisterhood of Salaam Shalom, building relationships of trust and integrity. Here in Houston, women lead for equality, equity, dignity and justice for all, and the Houston Women's March is a part of this larger movement that empowers each individual woman while being bigger than the personal agendas of any individual leader. Wake up, National Women's March. Wake up and set aside personal agendas. We women will all rise together, or we won't rise at all. What we WON'T stand for. The Houston Women’s March rejects all forms of racism, anti-Semitism, misogyny, white supremacy, oppression, and discrimination based on ethnicity, gender, ability, and other characterizations of our common shared humanity. HWM is led by women who are Jewish, Muslim, Buddhist, Christian, and other faith and belief descriptions. We are united in our love for our neighbors and our commitment to empower women. The Houston Women’s March is an independent Texas organization. The National Women’s March released a statement yesterday about anti-Semitism (below this paragraph). While we appreciate the challenge of living intersectional lives and engaging intersectional conversations noted in this statement, we ask the national organization to go beyond merely noting that “Farrakhan’s statements about Jewish, queer, and trans people are not aligned with the Women’s March Unity Principles” and make a clearer and stronger renunciation of anti-Semitism, hate speech and the destructive actions that spring from hate-filled language. “Anti-Semitism, misogyny, homophobia, transphobia, racism and white supremacy are and always will be indefensible. “Women’s March is committed to fighting all forms of oppression as outlined in our Unity Principles. We will not tolerate anti-Semitism, racism, misogyny, homophobia, and transphobia and we condemn these expressions of hatred in all forms. “Women’s March is an intersectional movement made up of organizers with different backgrounds, who work in different communities. Within the Women’s March movement, we are very conscious of the conversations that must be had across the intersections of race, religion and gender. We love and value our sister and co-President Tamika Mallory, who has played a key role in shaping these conversations. Neither we nor she shy away from the fact that intersectional movement building is difficult and often painful. “Minister Farrakhan’s statements about Jewish, queer, and trans people are not aligned with the Women’s March Unity Principles, which were created by women of color leaders and are grounded in Kingian Nonviolence. Women’s March is holding conversations with queer, trans, Jewish and Black members of both our team and larger movement to create space for understanding and healing. “Our external silence has been because we are holding these conversations and are trying to intentionally break the cycles that pit our communities against each other. We have work to do, as individuals, as an organization, as a movement, and as a nation. “The world Women’s March seeks to build is one free from anti-Semitism, homophobia, transphobia, sexism, racism, and all forms of social violence. We are rooted in a vision of a world where all women—including Black women, Jewish women, lesbian, queer, bi and trans women, Muslim women, poor women, immigrant women, Indigenous women, and disabled women—are free and able to care for and nurture themselves and their families, however they are formed, in safe and healthy environments free from structural impediments. “Building this world will take a long time and will require patience and empathy for each other. “We believe it is worth it. MARCH opportunities to VOTE, connect, support, learn, and keep making a difference! Ready to continue marching? Here are some opportunities to VOTE, connect, support, learn, and keep making a difference in March! 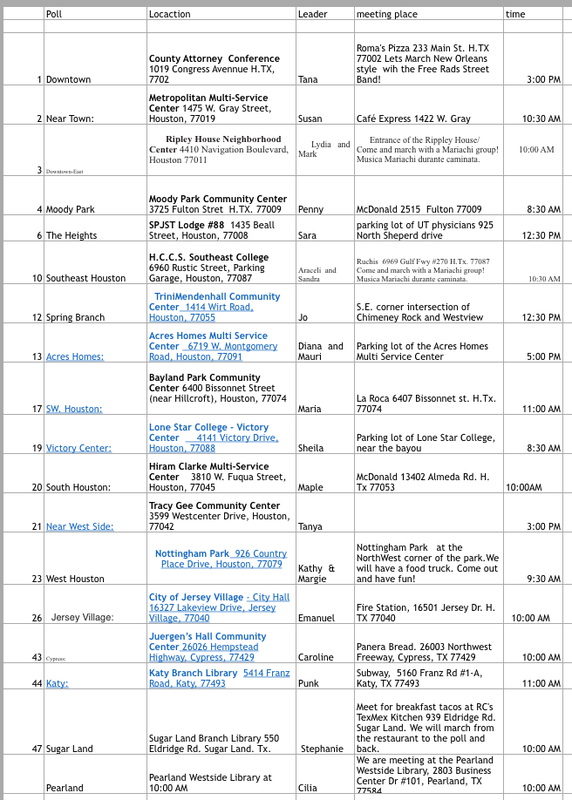 March 2 - the last day for early voting in the primaries - Harris County locations For Marchers registered to vote in other counties, your county clerk's website will have your details. March 3 - March for Black Women See more details below about joining the M4BWHou, including participating with the Houston Women's March. March 6 - Election Day for the 2018 Primary - here is the link to Harris County's polls and ballots. Please check your registration! For Marchers registered to vote in other counties, your county clerk's website will have your details. March 10 - Hidden Values and How to Talk About Politics - a fast-paced morning workshop from Houston Women's March for Marchers and allies. See more details below. March 24 - March for Our Lives Houston - we've partnered before with Moms Demand Action on "Gun Sense" and other commonsense gun policies. We're joining MDA and others supporting this student-led event. March 31 - Hidden Values and How to Talk About Politics - this is a crucial workshopabout insights into the hidden values that drive the decisions we make, and how to use these insights to have more productive conversations with others. This is part of our "Million Women" outreach series. Sign up here and see more details below. The Houston Women's March is active all year long with voter engagement and support of actions and other marches that intersect our mission for women and allies. Scroll down for more details on the March for Black Women. In this fast-paced hands-on workshop, we'll alternate between all-group feedback and small-group practice as we learn more about connecting the dots between values and actions, and why people we love or respect hold (or seem to hold) such radically different ideas. This is part of our "one million women" initiative in 2018. Men are welcome to join us! We are participating in the M4BWHou and invite you to join us. The M4BWHou organizers use their website to explain their purpose and how allies can support them: please visit their site to learn more. 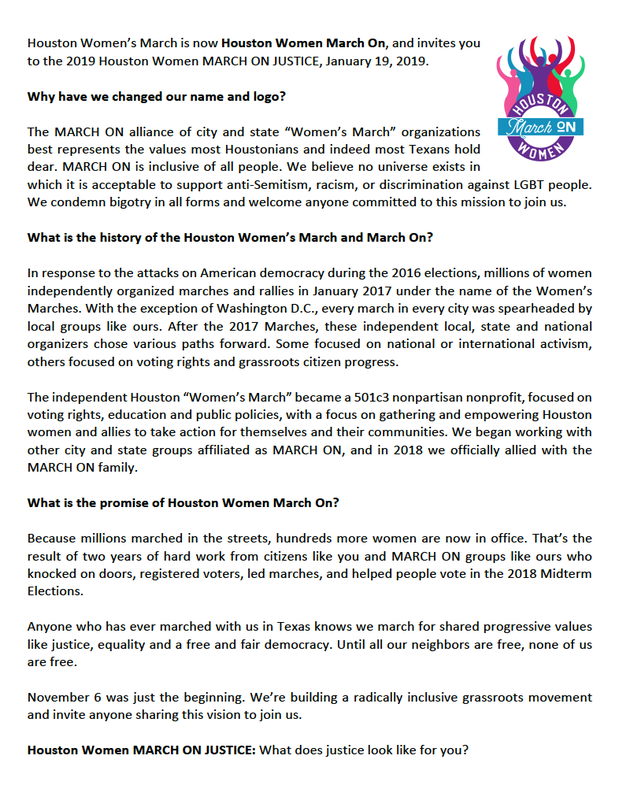 Here are details on how to connect with Houston Women's Marchers before and during M4BWHou. In keeping with the M4BWHou organizers' intent, we are not making a statement or creating attention for ourselves, so we do not plan to bring a banner or wear our t-shirts. Rather, please wear something showing solidarity, or no statements. We will have HWM logo stickers for you to wear to help Marchers locate each other. Cameron Waggett of The People's News on 90.1 FM KPFT Houston (Pacifica Radio) captured the magic of the moment when we rose our voices last month. Enjoy this video recap of the day! Thank You To Our 2018 Candidate Supporters! Thank you to the candidates who signed the values statement and contributed to the March. Thank you for supporting women in Texas! As a non-partisan non-profit organization, we do not endorse candidates. The 2018 March was a platform for everyday voices speaking about issues. Local elected officials joined the March and introduced grassroots constituents from their districts. Candidates were invited to March with Houston women, were given opportunities to sign our values statement, and some candidates even showed their support by donating to the March to help offset expenses. We've compiled a full list of women candidates for the March 6th Primary. This list includes all Republican, Libertarian, Green, and Democratic candidates for all primary races, from local to federal. We hope you find it useful as you head to the primary polls. Early voting starts February 20th! Good morning! We're looking forward to a great March today in Houston to kick off a year of civic engagement leading to the 2018 elections. By popular request, we have port-o-potties, a bigger sound system, peace officers, event marshals, and a first aid station. If you can, please contribute here to offset the March expenses. We are an all-volunteer, grassroots organization. Thank you! Following is our Marcher's Toolkit including chants, t-shirts, parking, and safety information for today. Some top items -- other than marching in solidarity! -- are dress comfortably for the weather, remember to follow parking regulations including paid/metered parking, and bring a filled water bottle. Feel free to meet us at City Hall if you are not able to march from The Water Works to City Hall. HPD & March Marshalls will lead our march to City Hall. *We will have American Sign Language Interpreters. Unity. Equality. Justice for All. Love! Not hate! Makes America great! We are the dreamers, the mighty mighty dreamers. Muslim Rights are Human Rights. Fired Up! / Ready to go! Hey hey! Ho Ho! Gender violence has got to go. PARKING: *Do not leave valuables in your vehicle. When parking along city streets, pay close attention to signage and meters. Please be neighborly! Parking on Allen Parkway Parking is available 9 am – 7 pm. *Parking garages & lots are privately managed and set their own fees. Music, marchers & extraordinary female artisans. HWM T-shirts & Totes for sale. LOST & FOUND: For belongings go to Houston Women’s March voter registration table. For lost parents contact nearest HPD officer. VOTER REGISTRATION: Volunteer Deputy Voter Registrar’s will be at the march. Allow sufficient time to travel & park. Plan to arrive to The Water Works at Buffalo Bayou Park by 9:30 am. Dress comfortably & appropriately for the weather. Eat before you arrive. Bring water, snacks/lunch, sunscreen. Stay hydrated! Signs & Posters. Poles/sticks are NOT allowed. In case of rain, cover your signs in clear plastic (a dry-cleaning bag with clear packing tape will work). Set up a meeting place---just in case you cannot get through to friends/family on your mobile phone. Obey police directions, even if you think you are right. (But you are not required to answer police questions) ACLU observers will be present. Not all marchers will want to be photographed/filmed. If someone asks that you stop, it is best to comply immediately. Legally you can take photos in public places, but antagonizing a fellow marcher is not worth the hassle. Anywhere there are crowds, be aware of your surroundings and if something doesn’t look right, move away and call 911. Leave no trace. Throw away/Take away your trash. Thank you! Share your Houston Women’s March 2018 memories! Wondering about where to park for the march? Accessible parking spaces are available in public surface lots downtown and there are several meters designated for accessible parking on nearby blocks surrounding City Hall. These are always free without a time limit. Vehicles with disability placards can also park at standard meter spaces for up to 3 hours free. 1100 Smith Parking Garage has 13 levels of paid parking accessible from Smith Street. For many of us, organizing the Houston Women’s March last year was the first time we ever took to the streets in protest and we did so because that is what this moment in history demands of all of us. And admittedly, we still have a lot to learn from those who have been sounding the alarm long before Trump rode a wave of misogyny, racism, xenophobia, and bigotry all the way to the White House. A healthy functioning democracy that respects the dignity and rights of all people would not have elected Trump. It’s clear that our system was already broken before Trump took office and many have been fighting these injustices for a long time. Our steering committee members have attended SURJ workshops on racial justice, and we have invited other groups and individuals to participate in planning this year’s march. Some have accepted the invitation, while others have declined. Our steering committee consists of 24 women from diverse backgrounds and over 40% are women of color. We are committed to inclusion and centering marginalized voices, but realize that we still fall short of that goal. We’re saddened to hear that some people feel as though the Women’s March is not for them, because it is for all people. And we apologize to anyone who felt excluded, it was never our intention. We realize it is up to all of us to act in solidarity with vulnerable and marginalized communities, which means that we need to listen to what people are saying and reflect on why some still feel excluded despite our sincere past efforts. And we also need to do better moving forward. It is our sincere hope that we can continue a dialogue with those that felt excluded and identify concrete steps that we can take to support and lift up all people and communities.